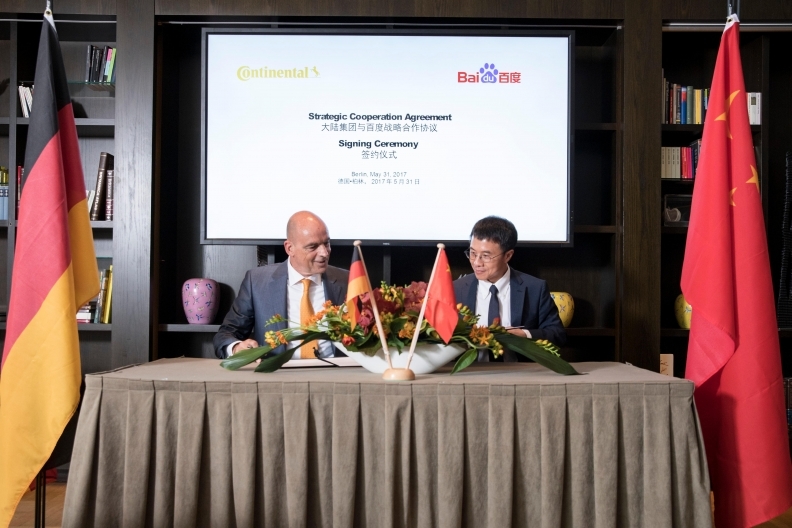 Frank Jourdan, head of Continental's chassis & safety unit (left), and Mr. Qi Lu, chief operating officer of Baidu, sign the agreement in Berlin to jointly develop autonomous and connected-car technologies. FRANKFURT -- Continental signed a strategic cooperation agreement with Chinese Internet company Baidu on Wednesday to develop autonomous and connected-car technologies. In a statement, Continental said both partners intend to develop technologies, products and business models that will provide solutions for automated driving, connected vehicles and intelligent mobility services. “With our strategic collaboration, we will take intelligent mobility an important step further,” Continental's CEO Elmar Degenhart said.